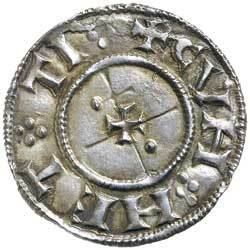 VIKING OCCUPATION OF YORK, (876-954), silver penny, Cunnetti type, York Mint, (1.28 g), obv. patriarchal cross, rev. small cross pattee, (S.993, N 501). 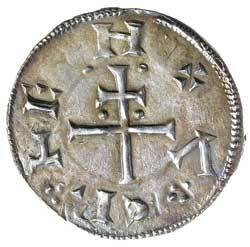 Attractively toned, good very fine with a clear die clash from the patriarchal cross. Ex Matthew Rich Collection and previously CNG fixed price list, June 2000, #719082.